We go above and beyond monthly financial statements to take the guesswork out of decision-making. View financial statements and other accounting reports. View a weekly summary of sales and prime performance. View sales and prime performance over time. View sales, deposits, and other Daily Summary inputs over time. View a list of historical bank and credit card transactions. View financial activity month over month. View information required for sales tax reporting. Historical inventory counts, prices, and balances. See how your numbers are changing over time. Consult your customary financial statements and accounting reports including income statements, balance sheets, statement of cash flows, general ledger, trial balance, accounts lists, journal entries, and more. Compare deposits, sales, comps, and other receipts and adjustments over time and on a daily, weekly, monthly, or any other period basis. View costs of goods sold and labor expenses as percentages of sales for weekly, monthly, and other periods, as well as corresponding trend analysis and performance tracking versus prime cost goals. Examine bank and credit card transactions and classifications over any period of time. 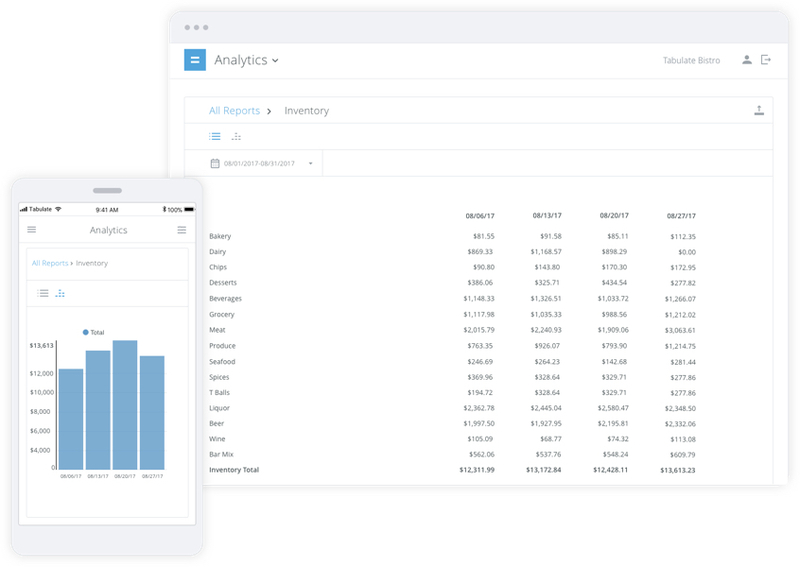 Review accounting and other reports for multiple stores on a consolidated basis, as well as on a store-by-store level for each individual location. Observe historical inventory counts, prices, and balances over time. 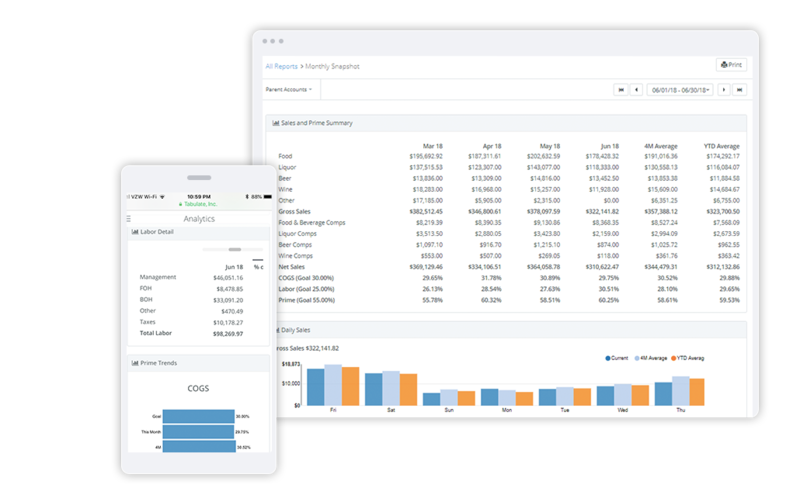 Tabulate provides a collection of reporting and analytics to help make data-driven decisions. 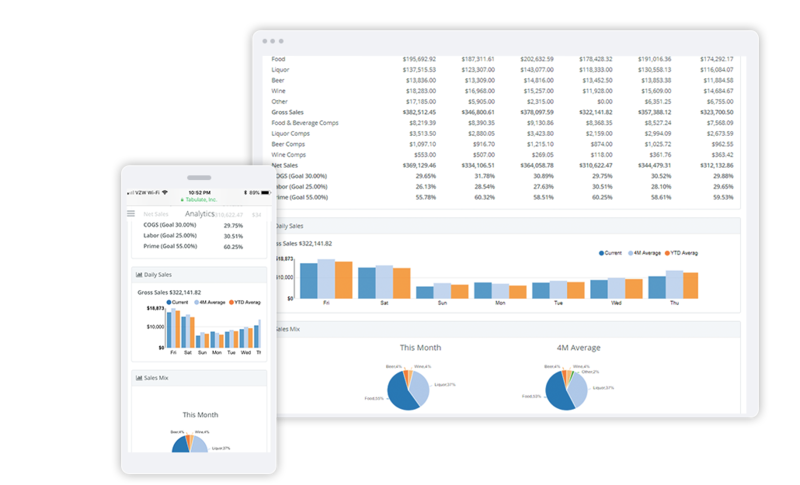 Keep track of your expenses and inventory, find where your business may have the most waste, compare data week-over-week and year-over-year, and learn how you’re performing against our trend analysis. With Tabulate, you know your numbers.